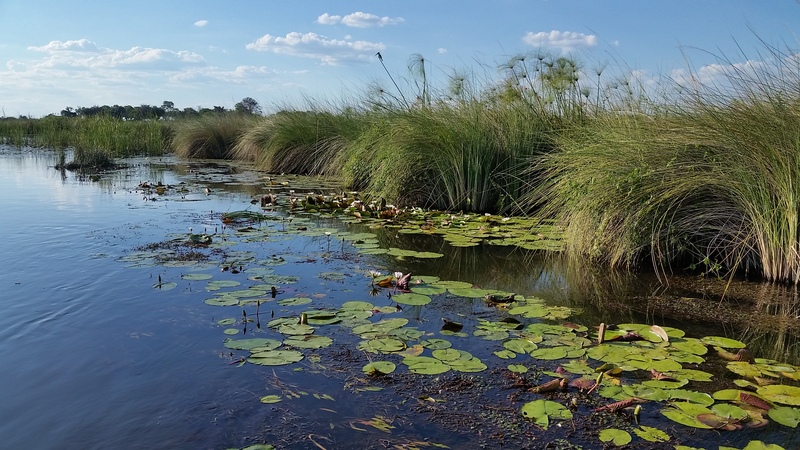 The Okavango Delta, unlike so much of the surrounding Kalahari Desert which covers most of Botswana, is a vast interconnected web of 15,540 km² (6,000 mile²) of marshland, lagoons, channels and islands formed by seasonal flooding. The Angola highlands to the northwest of Botswana receive three times the rainfall that Botswana does. Starting around November, this life-sustaining nourishment drains down the Okavango River, filling the fan-shaped delta throughout the months that follow. This welcome flood peaks between March and April, during which time the delta swells to three times its usual size. The Okavango Delta is part of the vast Makgadikgadi Basin, the remnants of the great Makgadikgadi Lake that dried up 10,000 years ago. Although other parts of the basin consist of dry, barren salt pans, the Okavango Delta is a large inland river mouth that is incomparable for its lush, green beauty and unrivaled as an inviting home to one of Africa’s greatest concentrations of wildlife. The Okavango Delta is called "the river which never finds the sea.” The majority of its waters are sucked up by plants or evaporated into the air, and only 2% of the floodwaters ever make it to the river’s destination, emptying into nearby Lake Ngami. The resulting marshes are the playground of a huge variety of species including hippopotamus, blue wildebeest, giraffe, Nile crocodile, black rhinoceros, white rhinoceros, plains zebra, warthog and Chacma baboon. Large herds of elephant refresh themselves in water sometimes deep enough for them to swim through. Buffalo crowd together in the safety of the swamp. The lions which pad silently through soft sand make a ruckus in the shallow water and the noise sends the wary buffalo crashing through the marsh churning its water to white foam as they escape their predator. One of the best places to view wildlife is Moremi Game Reserve at the eastern end of the delta. It was named after Chief Moremi of the BaTawana tribe. The delta’s largest island, Chief’s Island, is an area of slightly higher ground lifted up by a fault line. Originally dedicated as the chief’s personal hunting grounds, it is now a wildlife sanctuary considered to be the most beautiful location for viewing the abundance of African flora and fauna. This is a significant protected area for African wild dog, making it a great place for viewing this endangered species. White rhinos have been re-introduced to Moremi Game Reserve, the only place to see them in the delta. The Botswana government has also given some of the land in the Okavango Delta to outfitters who can then manage the land and offer private safaris. Pros of doing a safari in a private reserve. One benefit of visiting a private concession is that the number of visitors is limited to only those staying at the concession’s camp. Most concessions limit the number of vehicles at an animal sighting to three, which makes for more intimate game viewing. The wildlife, particularly the predators, tend to be in better condition than in public reserves, possibly due to a more hands-on management. Because the number of visitors, and guides, is limited, the caliber of safari guides tends to be very high in privately managed reserves. The biggest downside of private concessions is they tend to be more expensive, as they are all-inclusive and often accessible only by charter plane. Kwara borders Moremi Game Reserve to the north. Its location allows for Mokoro (hand-dug canoe) rides on one of the many Okavango Channels, or for motorboat rides on the delta. Kwando Safaris operates three luxury camps here. Splash Camp was opened in 2018 and offers well-spaced out ‘tents’ of a very high caliber. Kwara and Little Kwara are also owned by Kwando, with Kwara being closed for renovations through the middle of 2019. This area offer spectacular bird-viewing opportunities and, in addition to the big cats, is known for its wild dogs. The Okavango Delta is home to a large variety of antelope including lechwe, tsessebe, sitatunga, roan antelope, reedbuck, greater kudu, sable antelope, springbok and impala. The lechwe antelope is the most common large mammal, with more than 60,000 inhabiting the delta. These swamp-dwelling antelopes, slightly larger than an impala, bound effortlessly through the swamp due to the natural water-repellent quality of the fur on their legs. They frolic freely in the water, seeming lighter than air as their dancing leaps provide not just forward movement but raise them to heights from which they can spy danger. The rarest aquatic antelope found in the Okavango is the demure sitatunga, which hides from predators by sinking into the water with just its nostrils showing. It can even sleep under water like this! A completely unique experience of the Okavango Delta is a mokoro safari. Mokoro are traditional dugout canoes, and although the modern incarnations are made of fiberglass, the experience of gliding soundlessly through the swamp is as old as the waters themselves. Canoe trips through this Venice of Africa bring you face to face with wildlife. As the rhythmic poling sends the boat skimming across the tranquil surface, your awareness shifts, slows and settles as silence and stillness give way to the bustling activity of life in the marsh. Over 400 species of birds, including African fish eagle, Pel's fishing owl, ducks, geese, heron, crested crane, lilac-breasted roller, hammerkopf, ostrich and sacred ibis, fly above or wade through the delta. Fish flit through the waters of the lagoons, darting in between reeds and papyrus. Surrounding the swamps is a forest that provides shade for herds of larger game and extending beyond the forests is open savanna where the greatest numbers of game exist, stalked by lion, leopard, cheetah, brown hyena, spotted hyena, and wild dog. Leopards can be seen lazing in trees during the day. The endangered African wild dog still survives in the Okavango Delta, which is home to one of the largest packs in Africa. Dry season: The best time to visit is in the dry season where game viewing is at its peak from June to October. Rainy season: December to March. Because the delta is created from flood water not rain, the rainy season is the time that the delta is smallest. Animals tend to move away from the delta as other areas of the desert become green and lush. But with such an embarrassment of riches, fewer animals than usual still means many animals, migrating species arrive, and the birds love the rainy season. Showing 10 of 173 tour packages. Click here to see all tours. Tour by: The Elephant Trails Safari Co.
All five of the Big Five can be seen here, including the very rare white rhinos, which have been reintroduced to the Moremi Game Reserve. A large number and variety of accommodations from luxury lodges to tented camps are available. Best time to visit is between June and October. Healthy male cheetah in Kwara Concession.